With thanks to the customers who have allowed us to share their New Zealand vacation experiences. Let me tell you how sorry I was to hear about the terrible shooting in Christchurch. I hope you didn’t lose anyone dear to you. We were already in Australia when we heard, and it made our hearts sick. As for our trip, it was a resounding success—thank you. We thoroughly enjoyed ourselves, even with all the busyness. We enjoyed our time on the North Island, especially Hobbiton and walking around the cities (Auckland and Wellington). The beauty of the South Island is unmatched, in my opinion. We enjoyed Picton, hiking the Queen Charlotte track—stunning scenery. Highlights for us were Marlborough, Queenstown, and the sounds, especially kayaking in Milford. In my opinion, Marlborough is way prettier than Napa Valley. My son isn’t even much of a wine drinker, and he loved it. Australia brought its own sense of wonder, with the GB Reef—wow! Everything went as planned, with no trouble at all. As for feedback, I can let you know a couple of things we thought were more trouble than they were worth. The first was the glow worm cave after Hobbiton. It was a bit of a drive for a short excursion through a cave. Our guide was unenthusiastic and the worms weren’t all that interesting to us. It also increased our drive time back to Auckland, making it a very long day. Secondly, the all-day tour from Wellington, including Weta Workshop was not as interesting as it sounded. I think a half day of that would have been better. Thirdly, if I were redoing it, I would not spend the time (or money) going to both sounds. They were spectacular! But the days were very long due to their remote locations, and the sounds so similar, one sound day would have sufficed for us. Lastly, we were disappointed in the Daintree Rainforest. There just wasn’t much to see. Actually, it reminded us quite a lot of areas near where we live. I realize we told you we wanted to go, so it’s our fault, but 1/2 day would have been more than enough. I have decided that if we ever return (and I would love to) it will probably be on a cruise ship. I could have the best of both worlds, seeing most of the sites without all the driving. Thanks again Jane, for helping us with our very special vacation. Lindsay and Jane - Howard and I can’t thank you enough for your critical part in making our vacation in New Zealand so perfect. We gave you such little time to find us accommodations and arrange for our cars and sightseeing excursions but you came through with flying colors. We loved all of our accommodations and some were extraordinary. Friends ask us what was the best part of the vacation, and we can’t choose. The New Zealand people are so friendly and so creative, and everywhere we went we were astounded by the beauty of the land and the care for detail in every place we visited. Our room in Wellington at the MSocial. Again, even though it was a chain hotel, it was quite special with their emphasis on sustainability and sociability. We also had a beautiful view of the Auckland harbor (I guess we’re big on views - what a difference it makes to see a gorgeous natural setting from your window). It also meant we were across the street from the ferry terminal and the Maritime Museum which we enjoyed. "Shades of Jade" is a shop in Greymouth that Jan at the Breakers recommended. The owners, Catherine and Warren, are a delight. Catherine’s father was a jade carver so she was so informed and passionate about her pieces. We were glad to buy two pieces from them rather than from the commercial shops in Hokitika. The Franz Josef heli-hike - Excellent company ran the operation. They emphasized safety in a smooth way, and provided all the equipment we needed, excellent guide. Milford Sound - We had a beautiful day, so we had exquisite views throughout. We took a small plane back to Queenstown from the Sound, which we were glad to do to give ourselves an extra 4 hours - that plane ride was breathtaking (not cheap but worth it). Te Papa - incredible. We were sorry we didn’t spend more time in the Maori section, but we had to get on the road. 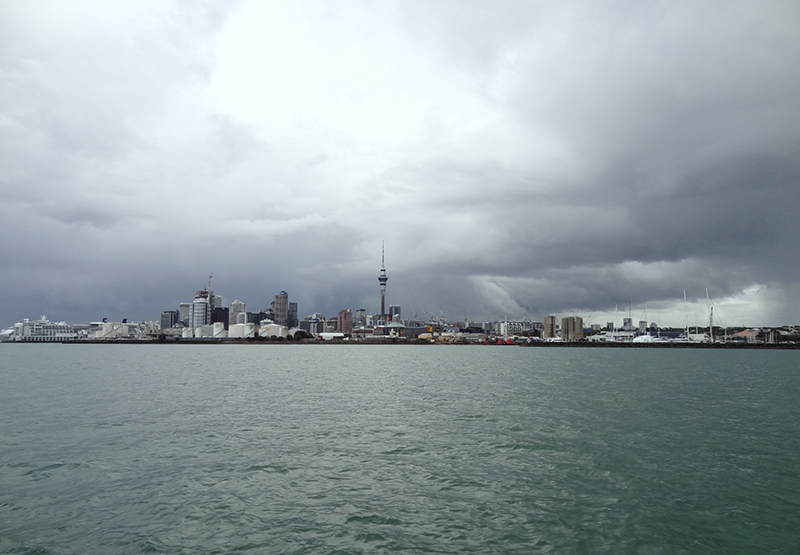 Auckland - we sailed on the Ted Ashby, a sailboat owned by the Maritime Museum in the Auckland harbor. Even though the sail was only for an hour, it felt twice as long since it was so pleasurable. Wanaka - finding the Straw Cottage. There are 3 buildings that use the address 40 Halliday Road, and we weren’t sure which building to go into. We called the number on the itinerary page, but it was for the wrong person, so Nienke needs to change the contact number on that. We did reach Nienke and she told us which building to go into. Taxi transport to Milford Sound bus. We met the taxi a little late because we were following the voucher directions which said, “Departure time 7:25. Please wait at reception 10 minutes prior to pick-up time.” So we got there at 7:15. The taxi driver had expected us at 7 am, which later in looking at the itinerary, I guess that was when we were supposed to be there. The taxi driver also wasn’t clear as to whether he should take us to downtown Queenstown or to the Frankton Bus Shelter. After talking to us and his dispatcher he took us to the bus shelter. Nienke should probably make the voucher clearer to include what time the customer should meet the taxi - just in case other people like us were reading the voucher instead of the itinerary. Working with Jane of New Zealand Vacations made our trip of a lifetime A TRIP OF A LIFETIME! Planning to spend 4 weeks exploring both islands was a bit daunting but Jane organize the lodging, routes, activities, etc. along the way and made the best use of our time covering the territories we requested. Knowing everything was vetted through a reputable travel professional meant we could be out adventuring and not fussing over minutia.It's hard to say what the best activity Jane recommended was or the most scenic area visited or the best accommodation booked or the most entertaining excursion experienced. Everything was INCREDIBLE and we thank Jane for her attention to detail and treasure trove of knowledge and expertise. She was a pleasure to work with. transformed those into a completely seamless package of itinerary and logistical support for transportation, lodging and activities. Hi Jane, I apologize for the delay in getting back to you. Scott and I really enjoyed and appreciated meeting you and Steve in Christchurch. We had a lot of fun getting acquainted. Thank you for meeting us. The Thai restaurant was a lot of fun. Our morning in Christchurch was very nice. We went to the Centre of Contemporary Art and the Canterbury Museum. We collected a couple more souvenirs for our friends/family and strolled through the streets until it was time to go. Christchurch really is a pretty city. 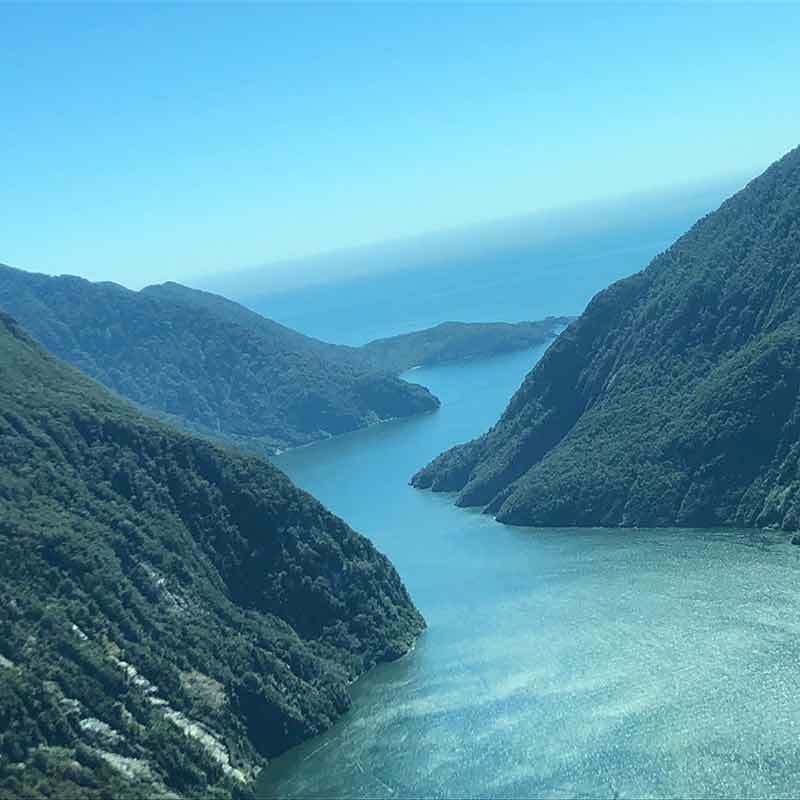 - Doubtful Sound because it displayed the raw, unspoiled beauty of New Zealand. I think it was also special because it was a smaller boat. We got some special treatment from the crew. Pass to the scenic Doubtful Sound. - Wanaka because it was like a mountain ski area where the locals were friendly and it wasn't crowded. It seemed like a place where we could live. I am very happy that you suggested Wanaka over Queenstown. From what I hear, Queenstown can be loaded with people and tourists. We enjoyed the trails, the opportunities that were available on the lake (although we didn't take advantage of them), and the community feel. We went to the farmer's market there and really enjoyed it. - Napier also had a wonderful feel to it. I was happy that we were not in the town center but close enough to walk to the wharf for an evening stroll and dinner. Or, we could walk to the beach. The town and the wineries were easily accessible by car. I really liked the location of the hotel. I would highly recommend Elephant Hill for wine tasting and a wonderful lunch. The winery has a nice, trendy vibe to it and lunch was amazing. It was a great place to wait out the rain. - The Quest, Rotorua: We enjoyed the apartment feeling, the amenities and the staff. - The Crown, Napier: It's walking proximity to the ocean and to dining, amazing views. - St. Clair, Dunedin: It's walking proximity to the ocean and to dining, and the staff. - Ranginui, Tekapo: We were so appreciative that we were not staying where all the tourists were. It was very relaxing, had a beautiful view, and Sab and Ann Maree were so enjoyable. Lupine meadows contrasting the green backdrop. The hotel we would say was our least favorite was the Copthorne. It seemed to be in a strange location, not easily accessible to anything. There were lots of tourists and the staff seemed a little disorganized. It was clean though. The Moorings in Wanaka because of the location. It had a really nice location and view. The balcony was very nice to look out at the lake. We could walk just about anywhere; trails, restaurants, shopping. Scott says this was one of his favorites. Lakefront Lodge in Te Anau had a very nice location and we really liked the layout of the room. I had started to feel sick while we were there and it was very convenient that the "living quarters" were separate from the bedroom. It was actually perfect for our situation. I stayed in bed one afternoon and Scott was able to read and go in and out of the room without disturbing me. The picnic table was very nice and we were able to enjoy some lunch out there. The staff was very friendly and helpful. "City Center" was within walking distance. However, I should note that the accommodations did seem a little outdated. If you need any more specifics, please ask. I feel like I'm writing a book here. I've attached some pictures. I will likely send more in a separate email as the file sizes are a bit prohibitive. 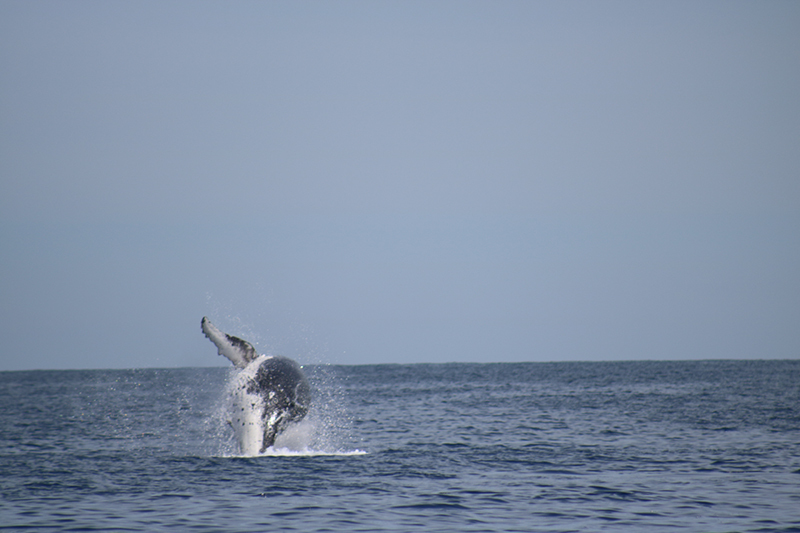 Whales spotted when venturing into the open sea on the overnight Doubtful Sound Cruise. Nugget Point lighthouse on the Catlins coast. 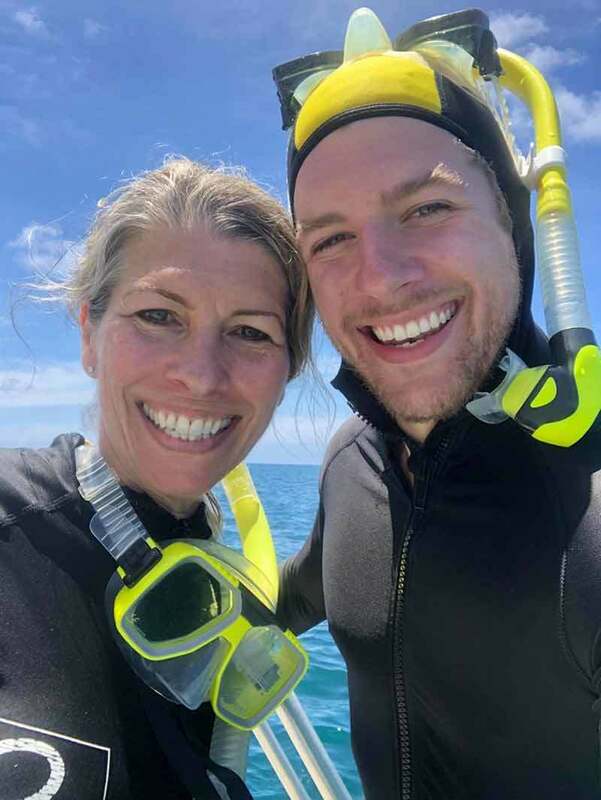 Thanks to the well-informed assistance of Jane Cousens at New Zealand Vacations (NZV), we just finished an absolute dream holiday. 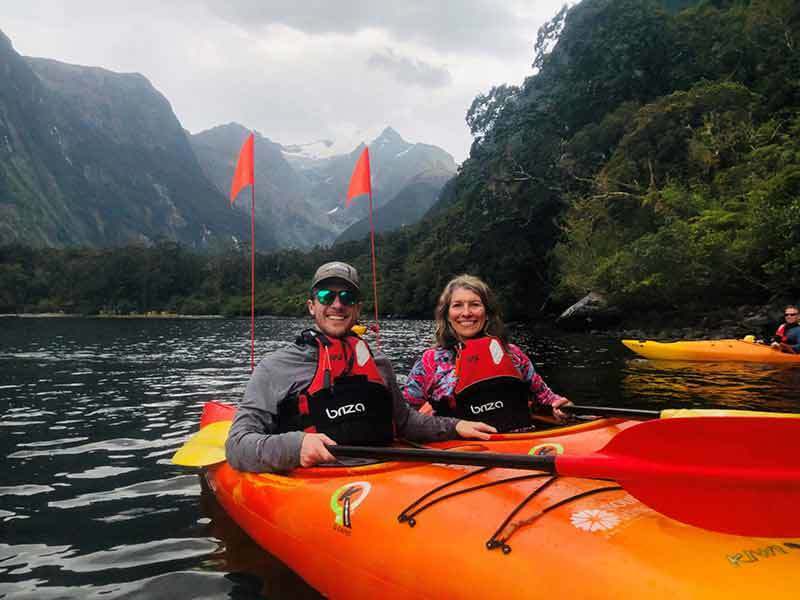 From our initial consultation through the final details and follow-up, NZV was not only exceptionally knowledgeable of our travel and activity options, but also very attuned to our personal preferences. The trip was masterfully orchestrated, and came off without a flaw. With all the logistics thoughtfully arranged, we were able to relax and make the most of the most magical country in the world. Thank you Jane and NZV! Sorry I didn't get back to you sooner. We got back and were back to work and wrapped up in the holidays. We truly appreciate everything you and Lindsay did for us on this vacation. It was thoroughly planned and you both went the extra mile. Thanks for making it a truly unforgettable experience. Feel free to use that as a review. Hi Jane. Just wanted to let you know how much we enjoyed our trip to N.Z! I'm glad that we used your travel services. We got to see and do much more than if we had tried to plan the trip ourselves. The 2 events that we were unfortunately unable to participate in were the Milford Sound trip due to the coach accident and the heli-ride at Franz Josef. We attempted twice to participate in the latter but unfortunately the weather did not permit the trip! Oh well...i guess another time! If you have any more formal way in which you would like our review we would be more than happy to write it! Julia. Thank you for everything Lindsay, it was the most amazing trip.. every bit of it! Will send pictures when organized. We ended up not being able to ride at Pakiri but we did ride with “Horse Trekking Lake Okareke” in Rotorua around Lake Okareke and Lake Tarawera. Beautiful trails and awesome horses. Highly recommend the company. Andrews favorite was the trip to Cape Reinga and 90 Mile beach. I dunno what I would pick... it was all so great!! Jane, We are back in USA. Waiting for final leg to DFW. Can share more detail when rested, but did want to send a quick note if our thanks for organizing a perfect trip. Exceeded our very high hopes for a great adventure. We were lucky to find you and your fine firm. On the day we proudly added this 'Reviews' page, we came across this article on Lifehacker.com, and after reading it, our hearts sank just a little. It seems that the art of creating fake reviews is much more prevalent than we realized. Lifehacker suggests "If a review is overly glowing with nothing but great things to say ... ignore it". So does that mean we should delete all of our reviews that had great things to to say? I don't think so. So let's be clear about one thing - every review you read here is the real thing, or as the Scot's would say, 'the real McCoy'. We hope you get something useful from them because they reflect our core message of every customer enjoying a vacation that is tailor made to their unique interests and passions. PS - Since writing this note a few people have asked me where I'm standing in the accompanying photo. 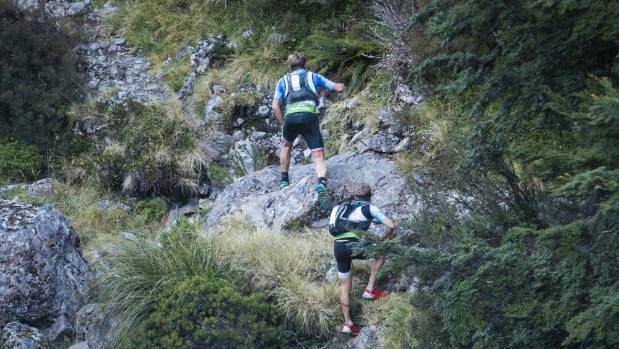 It's actually at the start of a trail that's a part of the annual 'Kathmandu Coast to Coast' race, one of the toughest sporting events in New Zealand. So to answer the questions, the photo was taken at the start of a section called Goat Pass that I walked with my friends Graeme Moore and Chris Paulsen in 2012. 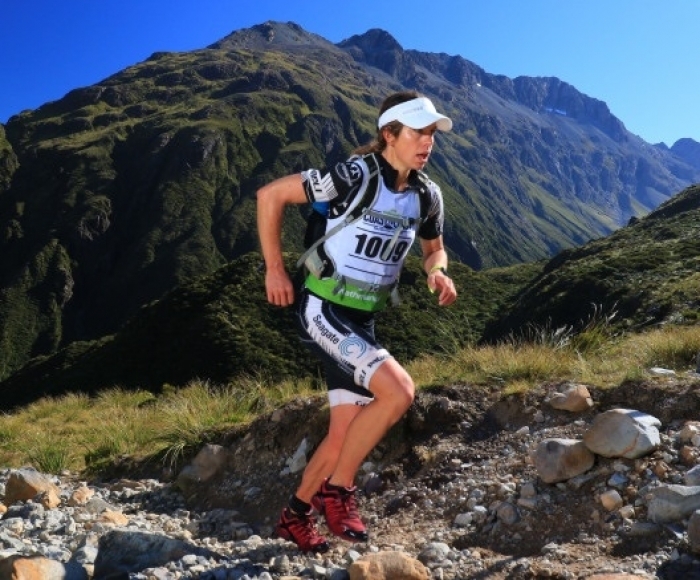 Over 2-days in February, contestants from all over the world get themselves from the West Coast of the South Island to the finish on the East Coast at Brighton Beach in Christchurch, a total of 151 miles! 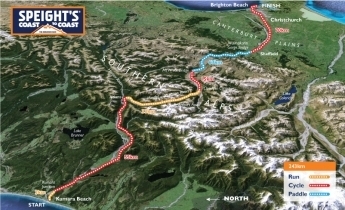 In the process they actually traverse the Southern Alps. 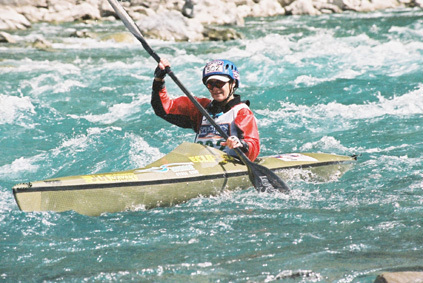 Some sections are run, some are biked and there's also a river that has to be kayaked. People can enter as a team or run individually. The elites try to complete it in 1-day, the rest take a more leisurely approach with just one simple objective - finishing within 2-days. Perhaps New Zealand Vacations should enter a team in the 2020 event. Jane, Just wanted to thank you for all your help on our wonderful New Zealand vacation. We are heading back to Auckland tomorrow and then home. Your country is so beautiful! If you send anyone to Rotorua, I cannot imagine a better place than the Black Swan! Location was perfect. The staff were outstanding and the breakfast was amazing. Also, I am glad you suggested Te Anau. A delay getting there but really enjoyed the town. Got to see snow, rare for us. The lady at the Radfords was very helpful and we were pleased. Wanaka and the Edgewater was a very good choice as well. So, again thank you so much! I will highly recommend New Zealand Vacations to my friends and family. through such varied and different places that really let us get a sense of the whole country. As always - we wish we had more time at each - but that's our problem to solve. I just called Mrs. Corrado who said the trip was wonderful. Mrs. Corrado said that Robert the Driver was OUTSTANDING and catered to their every need and paced their tours perfectly and they absolutely loved the tours. All in all they really enjoyed their trip, they just would not recommend using The Moorings in Wanaka to anyone. Note - this was a vacation New Zealand Vacations arranged in conjunction with Glenn Dybus at Cross Bay Travel Service located at Howards Beach, NY. It consists of two sections: Accommodations and Tours. I did quite a bit of walking in New Zealand. Most of it up and down hills. Having brought hiking boots for what I imagined would be occasional forays along various tracks, I found myself wearing them almost exclusively. Three of the five accommodations during my trip were situated uphill from town, a 10-15 minute walk. Not bad going down. A bit of a job going back up, especially after a day of exploring, eating, drinking and whatnot. Far enough to tire me out. Not far enough to justify an Uber or Takeme ride—except for my last night in Auckland when I called for a ride to the docks for a lovely dinner at Soul Bar & Bistro. As promised, here is my report on my New Zealand vacation. It consists of two sections: Accommodations and Tours. At the beginning, I said that I didn’t need anything fancy, just a nice place to sleep. All of the places booked for me met that criterion, with varying degrees of success. I was upgraded to a one-bedroom for no upcharge. The rooms were clean, the bed was comfortable, and the kitchen was fully stocked. A Continental breakfast was $13. Wi/Fi was not free; it wasn’t too expensive, but I declined. There was no reading light in the living room and, weirdly, no tables next to the couch, living room bed or bedroom beds. About a 20-minute to the center of town, most of it along a lovely river, and flat. A very nice room and a very friendly receptionist. Wi/Fi was free but I had problems connecting. Turns out, they’d only had the current service up and running for two days. Restaurants, grocery store, other shops were an easy 5-10 minute walk away. Again, I didn’t need fancy. But I was less than pleased with the bugs—mosquitoes and moths mostly—in the bathroom. Was told that it was buggy season, but that I should keep a window open because it tended to get damp inside if you didn’t. Ha! Closed the window for the duration of my stay. Also, washcloths and soap/shampoo were stored under the bathroom sink instead of being on the sink as in most motels. This was not mentioned at check-in. There was free introductory Wi/Fi, but after that you had to pay. The laundry room wasn’t very clean and the machines had instructions that were somewhat perplexing. Also, this was my first accommodation with a steep 10-15 minute walk to the center of town. Finally, the activities guide in the room gave the wrong time for a lake tour I wanted to take in the morning and when I asked the manager how to book it, he said to go down to the facility on the lake instead of calling himself. When I got there, they told me it was an afternoon trip and I had already booked a wine tour for the afternoon. Basically, it’s not totally awful, but I wouldn’t recommend it. Another very nice room, clean and well stocked. All staff were quite friendly and helpful. Another steep walk downhill to town. A pretty standard hotel room. Clean but not fancy. Friendly staff. The food in the hotel dining room was surprisingly good. I had the salmon grill with veggies, mash and a glass of wine one night and their breakfast buffet one morning—both quite enjoyable. This was my last accommodation and, once again, it was a long downhill stretch to the docks. 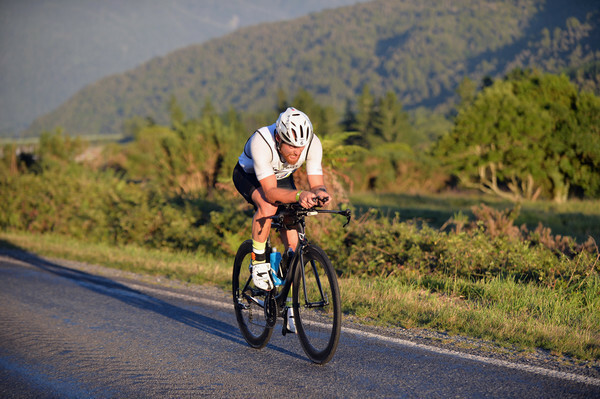 The ride up and over the hill to the village of Akaroa provided spectacular views of the countryside. Not to mention the insane cyclists laboring their way uphill. The cruise on the bay was quite enjoyable. My favorite bit was seeing the dolphins. Lunch was fish and chips at Bully Hayes, which had actually been recommended to me by the first Kiwi I met on the Shuttle, a guy named Scotti, who I think was a player on the All Blacks team. He’d been on my flight from Brisbane along with what looked to be several other players. The meal was every bit as delicious as he said. I had thought that this tour included kayaking, but it didn’t. That was fine, as I was scheduled to kayak at Okarito. TransAlpine from Christchurch to Greymouth. A spectacular ride. The car was clean and not crowded. The audio guide was very informative. And the views were gorgeous. One of my favorite parts of the entire two weeks. This wasn’t a booked tour, but I thought I’d mention how grateful I am that you arranged for zero-deductable insurance. It was either the first or second one-way bridge I encountered where I think I entered out of turn. Seeing a line of cars waiting that had the right of way, I sped up a little, then at the other end of the bridge, which was quite narrow, I edged a bit too far left and scraped the side of the vehicle. It sounded like I’d bashed in the side, but when I stopped to check, it really was only a scrape. I managed the rest of my driving days without incident, but was never so happy to drop off a car and be back to walking and public transportation. This was an epic fail on my part. Having kayaked many places before, I thought sure that I could handle what looked like, from the photos, an easy ride on calm waters. Instead, when I got there, a cold wind was blowing something fierce. After receiving detailed instructions on the route, I set off on choppy waters. But I missed the track I was supposed to follow and wound up being pushed around and onto sand banks where I had to climb out and tow the boat to deeper waters. After about an hour of no progress towards my goal, I finally called it quits and paddled against the wind to my starting point. Needless to say, I was somewhat embarrassed. But…lesson learned. Take the guided option, no matter how good you think you are. After the morning’s debacle, the guided hike to see the Franz Josef glacier was a pleasant change. The guide was very informative and while it was more than a stroll in the park, especially clambering over moraines towards the end, it counted as a successful journey. I especially enjoyed the post-hike soak in the hot pools. You didn’t book this one but I wanted to tell you about it anyway.This was a hoot. I was the only person on this tour and we rode around the country with the top down in an old Citroen. The wines I sampled at three vineyards were okay, but the best part was the conversation with my guide. I really enjoyed this one. Okay, so I drink better than I kayak. Thankfully, this tour did not repeat any of the wineries I saw the day before, even though it’s the same general area. They were all quite nice, especially the last one—Gibbston. Their 2014 Pinot Noir was my favorite. The weather was spotty as we set off. Again, the scenery was incredible. However, the cruise itself was basically rained out. Low clouds obscured the views while the rain and a strong wind made going out on the deck a soaking experience. I’d love to do this again in better weather. I wasn’t expecting such a long ride. The various experiences, farm tour, glowworm caves and the Maori show were fine. Next time, however, I’d fly down and back and spend a night in Rotorua. This was a great experience, thanks mostly to our guide, Alexander, and his young son Luke who was out of school that day. He was very knowledgeable and friendly and made sure we all had a good time. Kia Ora to New Zealand Vacations, and especially to Lindsay and Jane, for helping me have such a wonderful time traveling about your country. We really were very fortunate in our direction of travel, first the South Island and then the North. We avoided all storms. Upon landing at Christchurch, it was gray and rainy and we were concerned for the scheduled tours. Jane, I don’t know how you did it, but…. five minutes before tour time, all was clear, sunny and a beautiful day!! This happened over and over throughout the trip….thanks so much for looking after us! I was not excited about the activities of that first day in Christchurch, but we did enjoy the punting, Botanic Gardens Tour and the Canterbury Museum was very good. Akaroa was a nice day and the boat trip was lovely. The waters were a bit cold, but most went swimming with the dolphins although we did not see many. We quickly learned to add one half hour or more to each of your travel times. Driving was not a problem and we drove at normal speed, but needed more time than our itinerary indicated. As we continued, we were all amazed with the scenery, it was never boring. Arthur’s Pass was quite an experience and our driver (Mike) will always remember this drive! The West Coast with beautiful rainforest landscape was now our day by day scenery and it was beautiful. Walt is a licensed Arborist (54 years) and recognized most trees but said he had never seen them grow SO LARGE! We enjoyed the cafes as we drove along our route, especially liking the variety of different morning pies. Coffee, a little strong at times, but very good. We enjoyed the mini bus for our travels as it gave plenty of space for us and luggage. We perhaps should have changed our lodging and not have stayed at Hakitika. Yes, ocean front and ground floor, but the weather was cool and little activity in the town. We were surprised throughout New Zealand that by 3:30pm-4pm the shops in towns were closing. It did seem a bit early as many were tourist areas. At the hotel, all outdoor furniture had been removed from the ground units. Nice units but not much of a view or beach and too cold to swim. We continued on to enjoy Franz Josef. The scenery continued to be outstanding. Kayaking went well as we had a lovely guide and she did well explaining the area. The Glacier Valley Walk was fair and most likely we did not really need a guide. He was there on a work/vacation visa from the states and was very interesting. The boys especially enjoyed getting this information as they are now thinking they may like to take a year off and maybe work in New Zealand. It was amazing as to how far the Glacier had receded in just 10 years!! Wanaka was everyone favorite place on the South Island. Loved the Edgewater units and also their restaurant was very good. We were there for the hillside fire and watched for two days as the helicopters retrieve water from the lake in front of our units, trying to get it under control. The boys experienced mountain biking for the first time…Great! Here, they were willing to stay but we were once again off to see the Fiordland National Park. Milford Sound was a big highlight for everyone. A great cruise on a picture perfect day!! Many said this was not normal for most of their days?? The South Island was spaced very well for road travel time. Family members arrived in Wellington on a rainy day but with our arrival….all was sunny and clear. Loved the QT Museum Wellington lodging and it was in a perfect location. Dining was a problem as they closed the hotel restaurant for refurbishing and it was over a weekend with local restaurants also closed. Smaller restaurant located around the hotel were only able to handle smaller groups but we didn’t starve and soon we were off again. Our only choice was the Asian Eating House and that was a little high in price!!! After spending $500 on a group meal, several gave in to the local McDonalds. Didn’t enjoy Wellington as a city, but the sites were good and we had plenty of time to see them all. We did receive a street parking ticket as our minibus was too large to fit into the hotel garage?? They could give no suggestions so we parked where there were others also parking for the night thinking it would be OK. The next morning, all cars in that area had parking tickets. We programed both GPS systems in our rentals, but they provided very different routes so it was follow the lead car. Somehow, about two hours on the road we found ourselves on an adventure and the road disappeared?? It was exciting but I felt it best that we did not do it again!!. We checked the map and discovered that we were traveling on a “minor” road (marked in yellow on the map). BEAUTIFUL…but a little scary too!! Once commented, there was no turning back and it was about another 2 hours of driving before we were comfortable. The road ran out and at one point we walked the dirt PATH to make sure we could get pass the stone slides and washed out road. Another unforgettable memory!! We did see beautiful wild horses and also deer that surprised us crossing our path on a curve. This reminded us of home as there are many deer and quite a normal driving concern in Michigan/Indiana area. Once again, driving times were slightly short and more time was required. We missed some of the sites traveling from Wellington to Tongariro especially the town of Bulls. Per the itinerary, it sounded nice to visit as did the clothing manufacturers. I guess we were not checking our maps close enough. Hiking was not high on our list and had we hit the National Park in bad weather, a two night stay would have been too long. The “Ski” lodging was OK, we made due and did not see many other options in this area. We were once again very lucky and experienced great weather. The ski lifts were running which we enjoyed and we also took a plane trip over the volcano sites which filled our extra day with lots of fun. The next travel day was a long one and not really enjoyed by most. We departed about 7am (no breakfast) and drove to the Glowworm Cave….had plenty of time and enjoyed this tour. We left immediately and drove to Rotorua for our 2pm tour (this was not enough driving time) and we missed about half of the show. This was the last show and tour of the day, so no way to make it up. Rotorua looked to be a little touristy, but interesting and there were some events that the younger members of our party would have liked to experienced….but no time!! With little to eat….we drove onward as we were worried about day light and the time that we would be arriving at our farm stay. This was lovely but again, not what was expected--BETTER. Joy cooked a WONDERFUL dinner for all and we left no scraps!! Breakfast was just as wonderful and we all enjoyed a much needed night of sleep and a good evening/morning shower!!! Being a working farm, we were hoping to buy some articles made from wool, but never spotted a good place to purchase. Nothing was available at the farm but this would have been nice. The next day we were off for our Hobbiton Tour. It was fun, but again different than as expected. They have a great idea but need someone with a “Disney” mind to expand on what they offer. As Americans say, “they left a lot on the table”. A great start but there is so much more they could offer to enhance the movie experiences and maybe someday it will happen. Now it was time to move on to the Coromandel Peninsula.It had been a little cool and we were all hoping for warmer weather. When we arrived….units were all upstairs with lots of steps, not together and spaced out. Yes, it was warm weather with NO breeze, NO air conditioning in the units and NO views??? Yes, spoiled Americans’… I know??? This resort was in a great location and it was easy to get round. The food was good everywhere, but service….well…..an hour or more per wait after placing orders and it didn’t matter where we went as it was all the same. Evening meal was a social time for us…so we made the best. The people at the resort were all very friendly and helpful in planning our days. There was a lovely grill and we did cook a few of our own means. We all enjoyed the springs behind the resort and also the hot beach area. On our last day, we took a boat trip showing us the area we did not drive. We booked with “Ben” Cathedral Cove Tours and he provided us with a wonderful 3 hour experience. Swimming was possible, not too cold, and he fed the fish to give us extra fun during our swim. His trip was exceptionally good and I would recommend him to anyone. Back to the USA…..thanks again, we really did have a lovely time and have many wonderful family memories that were all enjoyed in New Zealand. Beautiful spots can be found everywhere in the world but I can’t name a country that is throughout the whole country, as completely BEAUTIFUL as New Zealand. A country that we found to be exceptionally clean, friendly, safe, interesting and lovely on every day of our trip!! My husband was not in a hurry to return home and that’s a first for him. He, as we all, loved your country and would be quite willing to live there. I am sure that someday, several will do a return visit. This was another trip that will make our family history book with lots of pictures and good memories. Thanks again for helping in this adventure. The teens in the group did miss a few days of their college year, but the teachers worked with them all and it’s turning out OK. They are all “A” students and upon returning home, they were able to get the classes as needed for this year and only had to make up a few missed lessons. Sorry for the late report but being under the weather I had a slow start at getting to the issues at work and there were many. All’s OK….. Thanks to you both, we had a wonderful vacation!! Hi Lindsay, We’re home in Houston once again. As you can see, we did manage to find Peters Lookout and the panorama was incredible. Lake Pukaki was an absolute mirror as you can see (see photo at the top of this page) I’ll be writing you some more later, but all in all, my heartfelt thank you and ... appreciation for the wonderful trip you assembled for us. Here are lots of thoughts about our New Zealand vacation. The bottom line is there is very little I would change or even consider changing. It was fantastic. The country is wonderful. One of the things we all agreed on that another week would have been great, but that was just not possible with the limited vacations schedules the kids had. They were limited to two weeks, and the Easter weekend gave them time for need catch up rest from jet lag. First, the written itinerary you provided was excellent. All the information was there. At each accommodation, we were always expected, and each reservation was in order. The excursions or tours were all prompt. The people were kind and considerate. Mon,Tues - Auckland – the MSocial hotel was fine, but perhaps just a wee bit too modern or sparse in room décor and appointments. I know, a strange comment, but it needed more places to set and open suitcases. It didn’t seem to be a vacation hotel, but a 1 or 2 overnight stay hotel. Other than that, it was super. Staff were excellent, and everything you would expect for an urban hotel. The Bush and Beach tour was excellent. We had a mini bus to ourselves, and our tour guide was Jeff. Highly recommend this to everyone. Wed - Matamata – the de Preaux Lodge was a great BnB place. ou did an excellent job in finding this and booking us there. Ian took the time to show us the farm, especially his bees. The morning breakfast was as it should be, we were all at one large table, plus there was another family of 3 from Australia who were also seated at the table. Hobbiton movie set – Simply said, I have been waiting about fifty years to see the Shire in person. It did not disappoint me nor anyone else. As our driver Mike said, Sir Peter Jackson should have been named a saint, instead of just a knight. Thurs - Rotorua – Novotel Lakeside hotel. Janis has already told you her opinions, and we appreciated the steps you made with the hotel in Queenstown. The rooms were all right, it’s just that some items were not maintained or inspected as well as they should. But we managed just fine as they were. Waimangu Volcanic Valley – Mike drove us past thermal springs or geysers in Rotorua saying he was taking us to a much better place to see things. And he was right. We had a good time hiking and seeing things. Janis and Rae did some of the hikes, then caught the bus to take them to the lake at the end of the trail. And then went back to the visitor’s center. The rain held off until we were bussed back to the Visitor Center and the souvenir shop and café. Mitai Maori Village – this was great, it was well done, and all the performers and dancers were superb. Fri – Wellington – The Bolton Hotel – Wow! We were utterly and completely spoiled by the rooms, all were suites. We could easily have spent another whole day in Wellington, there is just too many things we could have seen. Zealandia – the dusk tour was ideal, even the weather cooperated somewhat. While I didn’t expect to see a real kiwi, I did see the underbrush moving and what could have been the side of one. All in all, I’m glad we were able to do this, and that you were able to be there with us. Sat – Dunedin - Hotel St Clair – this was an unexpected treat and stunning location. Even though room descriptions said “ocean view,” I did not expect to be as close as we were to the ocean. The wind and sound of the surf was spectacular from the room. Another day here would have been good, especially since many were still recovering from the 6 hr drive the day before, and the extensive hiking at the thermal springs on Thursday. 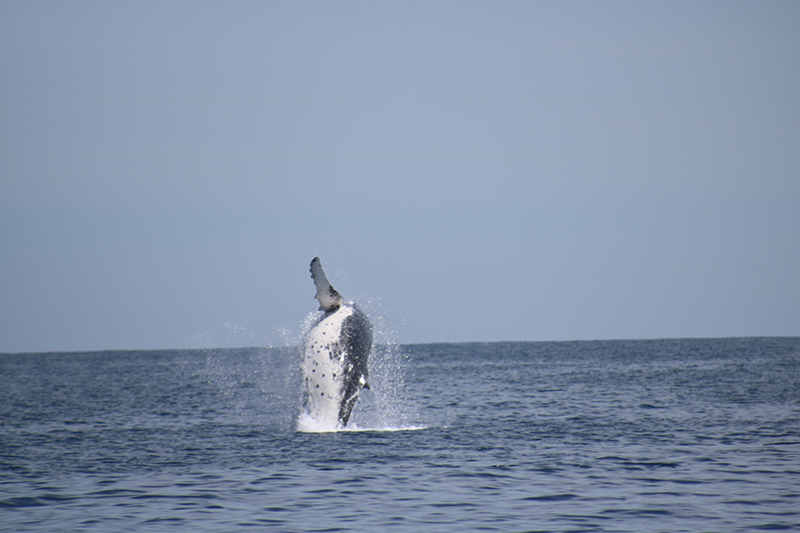 Peninsular Tour – Elm Wildlife Tours - this was exceptionally well done, however only 3 of us decided to go (Janis, Sarah, and me), the others wanted a break or just more free time on their own. The tour was good, and we got to see everything as promised. However, I would probably use different words to describe the steepness of the beach bluffs for viewing the penguins and the seals. They were akin to ascending many flights of stairs, maybe 20 or possibly 30 flights. The reason I use that comparison is because most everyone would understand it better than a phrase or word such as strenuous, or extremely difficult. Sun – drive to Queenstown – we followed the preferred route. It took us past several wineries, and we stopped at one about 30km from Queenstown. Jennifer and Matt were especially pleased with the quality of their wine. I’m not that much of a wine aficionado, so I’m not recalling the name. Oh, well. 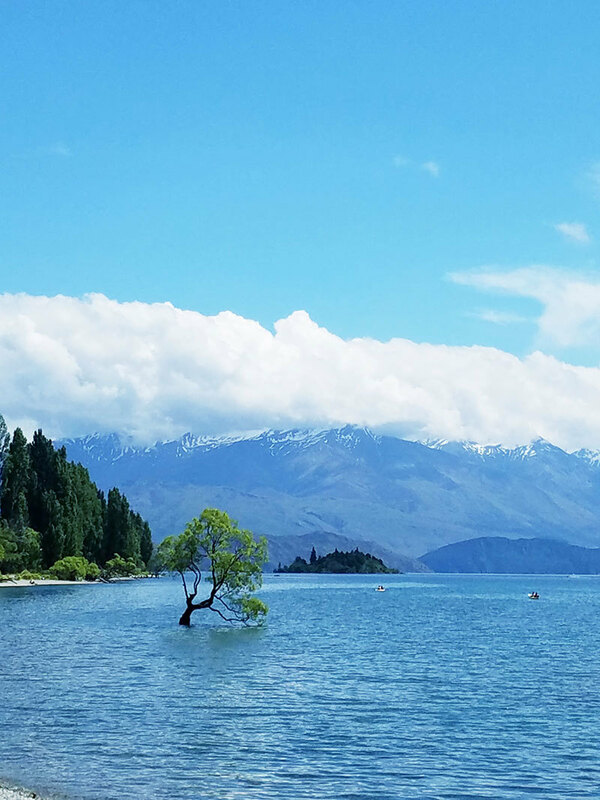 Sun – Queenstown – Novotel Lakeside Hotel. Similar layout to Novotel in Rotorua, but much better in many ways, thank you for intervening on this potential problem. Queenstown is interesting, way better than Rotorua, probably because it’s less accessible, but there are so many shops and things to do. Janis and Rae found the casino and recharged for a couple of hours. The day off was an excellent plan. Jennifer and Matt tried fly fishing. Rachel and I did off-road quading. 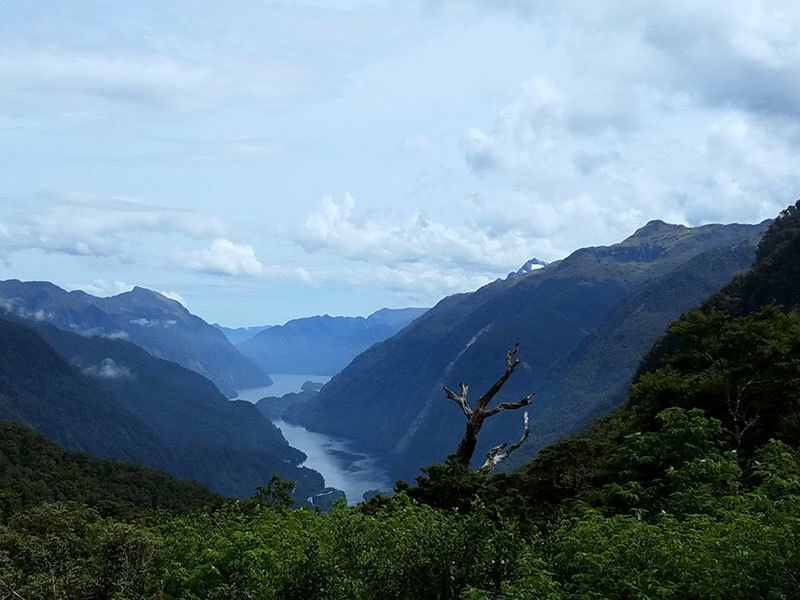 Tues – Milford Sound – the drive there was in the rain, so scenery was scarce. But once close to Milford Sound, the rain completely passed and we were able to see better. The rain had been so heavy at the sound, that the tour operators had to cancel the morning tours and evacuate where the Discovery facilities were. We missed our 1:00pm excursion by about 1 minute due to traffic and going to the wrong window first. But due to the morning cancellations, we were put on the next excursion at 1:30pm. Everything worked out fine. Initially, the 4 of us that were going to do the kayaking had decided to not to do it, but after the excursion, they all changed their minds and they went on it, while we did the Discovery part of the underwater viewing. The downside of Milford Sound was the round-trip driving. By itself, it is quite manageable. But coupled with the other driving we ended up doing on the South Island, hindsight says a bus tour might have been better to Milford Sound. Or maybe just more time on the South Island would have made things less hectic. Wed – Aoraki / Mount Cook – The day was gorgeous; the scenery was spectacular. Mission accomplished. Thurs – Christchurch and the return home – the drive was fine, it was somewhat like leaving the wilds and returning to civilization. Well, maybe not that pronounced, but starting from Aoraki and ending up at the airport a few hours later is quite a change. The side track to Hawaii added about six hours to our flight time, so we got back to Houston about 7pm instead of the planned 1pm. Fortunately, Air New Zealand is top notch, and they had the right credit card to get additional fuel promptly in Hawaii. In summary. New Zealand is a wonderful place. Everyone should be able to make at least one trip there in their lifetime. When it was over, and we were back in Houston, we all agreed that we should have done another week. But then, that would not have been enough, and we would have wanted a whole month. For your and Jane’s role in all of this, thank you from the bottom my heart. It was truly a remarkable time for all of us. Thank you for setting up a very memorable trip! Hi from Fox Glacier. Just wanted to let you know we're having a fabulous time! Lindsay, I think the itinerary is absolutely beautiful! Your company did a wonderful job. Thank you, again, for everything. We ended up skipping Blenheim because we had seen a couple of world war planes in the prior museums, and also Ike didn’t want to drive after an afternoon of wine tasting. But we know we won’t have any trouble allocating that “spare day” - every one has been fabulous so far! Our visit with Jerry was fun - thanks for setting that up for us. We appreciated his mini-tour around Wellington and getting to areas we would have missed. He said he posted some of the pics of our time together… i can’t check them out because internet is very slow at the campground and the wifi service we purchased was SO poor that we cancelled it. My favorite has been the Alpine Crossing… spectacular! Ike enjoyed that too but we both agree we are glad we aren’t doing the full Milford Sound Track! Oh, he loves all the birds! All for now - catch you mid-December if not before. The folks we encountered were universally friendly and helpful. We enjoyed mountain-biking in Rotorua, Wanaka, and on the Rail-Trail near Christchurch. 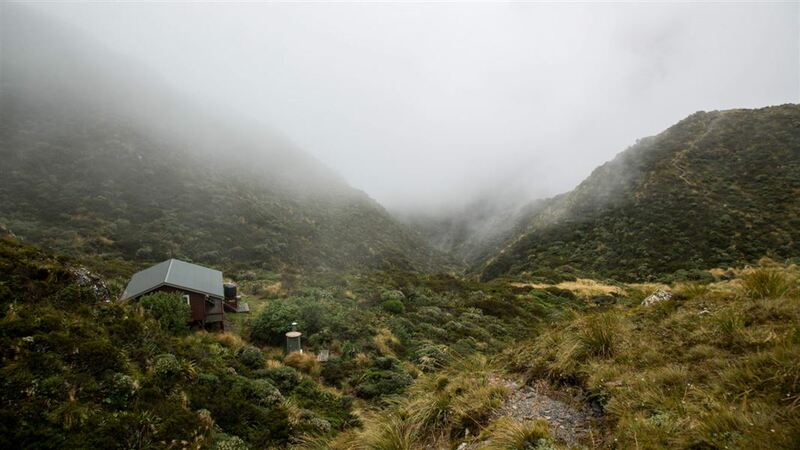 Lots of great hikes, including the Tongariro Crossing and the Rob Roy Glacier Track. 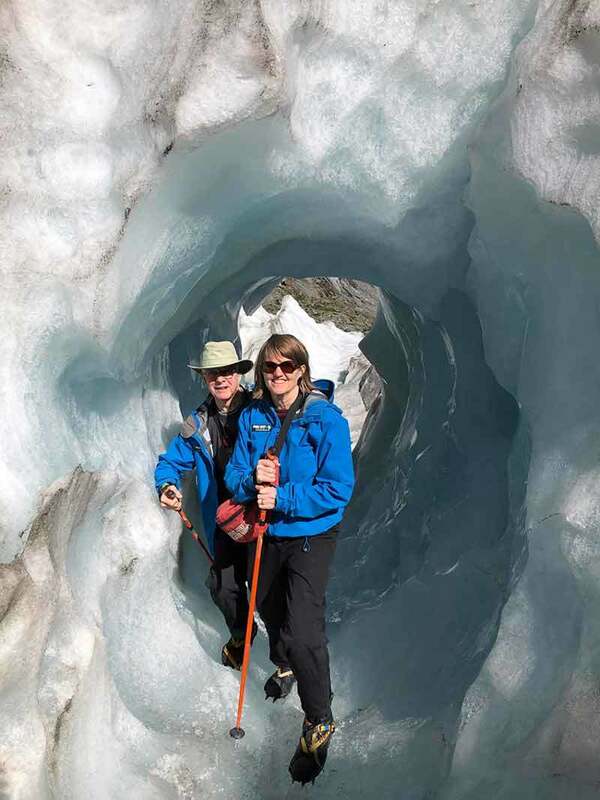 We had great weather, except for three rainy days in Fox Glacier, which we enjoyed anyway (except damn those sandflies!). Highlights also included consistently great food and excellent craft beer. Thanks again for your help in creating a memorable vacation! We had some add-ons that made it really personal and special for us. : my reunion with the town I lived in so many years ago, Te Awamutu. Also, the chance for David to have a second telescope adventure at Stargazers in Whitianga. But, the special trips you suggested were such a hit: the penguins, the observatory at Mt. John, Abel Tasman (that was a highlight), the Maori feast...and many others. I mentioned to Lindsay that my daughter (the horse veterinarian) and her boyfriend have booked a trip to New Zealand toward the end of May. They are really hoping they can snag Lindsay for coffee and a chat when he returns. We absolutely loved the morning we spent with Totally Tarawera, a family outfit with strong Maori connections who took us out on Lake Tarawera by boat to some geothermal beaches and told us lots of great Maori stories about their relative Sophia. Best and many thanks to you both. the heli- hike at mount cook. We had no issues, drivers were there there when we arrived at each place. In terms of hotels, there were 2 hotels that were just ok. The park hotel in national park had very uncomfortable beds, The Aspen hotel in Queenstown was not in good shape. The lock on the front door and bathroom was broken, the carpet was coming apart from the walls , and plaster coming off the ceiling. None of these things took away from the trip, just giving honest feedback. Fiji was very relaxing and the accommodations were nice. Let me know if you have any other questions that we can answer. New Zealand was Beautiful! The water was so clear and blue and we loved the people there! We saw the glow worms in Te Anau and that was amazing! Thank you (and Lindsay!) for all your help, it was a great trip! the skies have opened. The drinking water in most places was a treat. After Wellington, the trip still went very well. Queenstown may have been our most favorite place, the lake is just stunning, there are some neat hikes nearby, and the downtown area was pleasant to walk around in (plus Fergburger is delicious!!!). We did the first leg of the Routeburn Track, did a winery tour (where we drank a lot more wine than I expected; I was glad they dropped us off at the hotel! ), drove out to Milford Sound and did a cruise there, and spent a morning walking around Arrowtown. We then spent some time in Franz Josef, Greymouth (drove up to Punakaiki), and hit Christchurch for one night before flying home. The hotel in Queenstown was great, probably the best one we stayed in, which is good as that is where we spent the most amount of time. The Routeburn Track was a nice hike, saw some good views, although it was a steady rain that day. Milford Sound was fantastic, but the drive made it quite a long day. I think the overall experience was a lot of driving, but only because we had this one very long day. We were going to do Milford Sound before the Routeburn Track so we would have had one more day of very little driving before going out to Franz Josef, but the weather was rainy that first day and supposed to be sunny the second, and we wanted to be in Milford Sound on the sunny day. 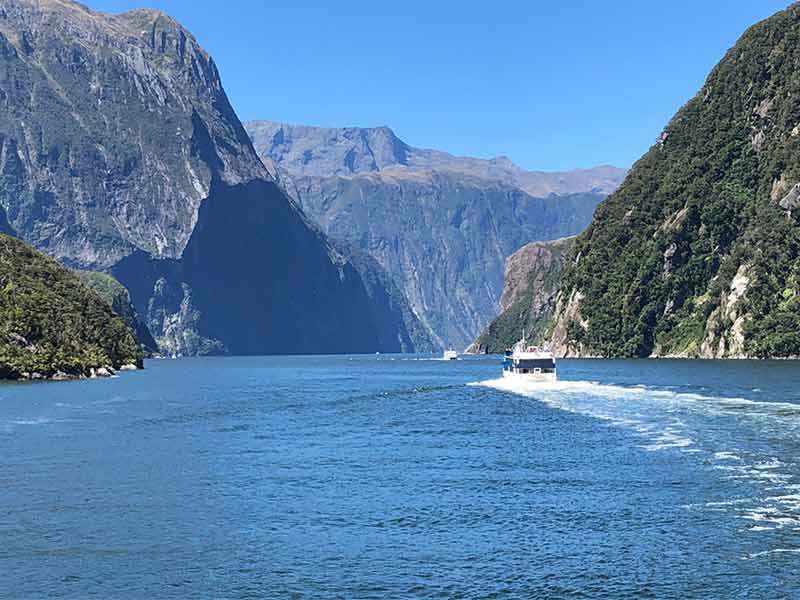 Some of our best pictures came from the cruise on Milford Sound. I am going to compile our pictures and put them on a dropbox and if you would like to see them you are welcome to. Arrowtown was very nice, just a quiet place to walk around and see some small shops. We had a great lunch at a small place called the Stables Restaurant in Arrowtown. Franz Josef was not as great as I had hoped, mostly because the view of the glacier has become a lot smaller than it used to be (at least, according to pictures), and the drive there was pretty long. The town was nice, very small, but it had everything we needed. The hotel was great. We watched the USA presidential election from a restaurant there. Greymouth was cool to see, mostly because it was definitely not a tourist-y place. We found two small takeaway shops that had probably the best fish and chips I have ever had, and I really enjoyed that. The Pancake Rocks were really cool, we got some nice pictures there, and we did a few hikes around there as well. The Point Elizabeth track was a pretty normal hike with a great view at the end of it. The hotel there was also very nice. In Christchurch, we walked around Hagley Park and saw the different gardens, and that was very enjoyable, and had dinner at a restaurant not far from the park. The earthquake that night woke us both up and was rocking the entire hotel around, and that was definitely interesting. I had never been in that large of an earthquake before. We were fortunate that there was no road damage between the hotel and the airport, and that all the flights were still moving on time that next morning. The flight back was tough, because Monday to us was about 42 hours long, and we didn’t get to sleep much, but that is the price of traveling! Overall, Heather and I had a wonderful trip. We were glad we went to the north island first, and also glad we drove rather than taking tours for everything. The hotels were all very nice, although I would recommend something different in National Park just because the rooms in that hotel are so incredibly small. All of the timing worked out well, and even though I was worried about getting off the flight in Queenstown in time to make our winery tour, we had plenty of time. The travel agent was very responsive and open to making any changes we wanted, and she did a great job about following through and getting it done. We will certainly let you guys know if we ever decide to go back to New Zealand! We did a kayak ride and then sat out in the hot tub. The staff was fantastic as well. We went out on the deck at midnight (on our own) to see the stars which was magnificent. The flight back on the 8-seater prop was just icing on the cake. The views you just can’t anywhere else. Another highlight was the Walter Peak Farm. The views from the Earnslaw were amazing. And the scones were the best we’d ever had. 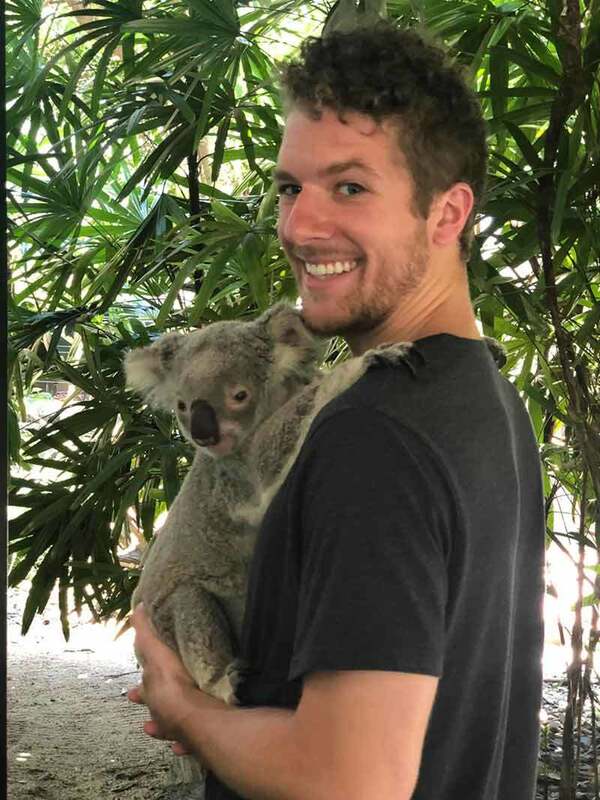 It was a joy to see the animals and just great all around. I’d also say we were completely blown away by the Christmas dinner. I don’t think we thought much about it. But between the views and the elegance - it was definitely a highlight. The luge ride was a blast - more fun than we expected. The glacier hike and helicopter ride were a treat. It was a bit more strenuous than we anticipated although we did fine. And we got major props from friends on Facebook for those photos! And Punakaiki was like no place we have seen. We loved New Zealand - the ecological focus, the care for the environment and the people were quite friendly. We would definitely go back. If anyone asks for tips, we will send them your way. Thanks again for all of your help. I was actually going to ask if there was a place (trip advisor?) where I could give a public comment, because I really feel like this trip was everything we had hoped it would be, and more. Coming back to work has definitely been a shock." Aspen Hotel: overall, it was a really nice place to stay. The room itself was great. The renovations were much appreciated even if I did occasionally hear some work in the hallways. The shower especially was maybe the second nicest shower I’ve been in. Beautiful view over the lake. I didn’t try much of the food or the bar, but the view alone is worth it. Some people might like a hotel that’s a little closer to the city, but a drive is not long at all and I really appreciated the walk. Even getting the exercise to walk up the hill at the end of the day was nice. And again, can’t beat that view. Town itself: probably my favorite city in New Zealand so far. Wonderful European town with tons of things to do and more shops than my wallet liked, but my friends appreciated it. Great food. I had Sweet Bambi at Fergberger. Went to Vudu Cafe for breakfast both mornings and sitting outside to watch the pier and the people was lovely. Great spot to read too. AJ Hackett Nevis Bungy: that was a blast. Forgot if I mentioned that I had done bungee jumps before, this was my third bungee and fourth if you count controlled jump, but the Nevis certainly has the best view. When I go back, I’ll definitely do the original too because I want to jump above water and then be lowered into the small boat below. Milford Sound Tour: this was my favorite thing I did. I can’t thank you enough for booking this experience. The guide we had (Roland I think?) was wonderful — a very quintessential Kiwi that I’ve been hearing in my head every time I try to do a Kiwi impression. The drive to and from was well done, with lots of interesting facts about the area and New Zealand as a whole. It was a rainy and cloudy day so the entire landscape looked misty and beautiful. Stopping in the little town halfway to the Sound was also nice. Bought some delicious pies there for my boat ride snack. Speaking of the boat ride… I can’t imagine a more mystical and beautiful location. The water and the mountainsides and the waterfalls were already spectacular, but coupling that with the rain and mist and low clouds… I easily could’ve spent a full day there and been content. I took over 400 pictures on this day alone and having a hard time cutting them down. Auckland City Hotel: this was fine for a transitional hotel. Definitely coming down from the spectacular view of Queenstown, I had a view of a nearby apartment building and overlooking a parking lot. The cafe in the lobby was actually really good though. Small room size, but again, totally fine for a transitional stay. Town itself: There’s a nice square just a block away from the ACH with 4-5 nice restaurants/cafes that I ate at twice. I didn’t really explore the Sky Tower area, but walked up and down Queen St several times. I should have personally looked up more events that were available and open when I arrived because I didn’t realize there was a Banksy exhibit at the museum nearby, definitely would have checked that out. Hobbiton Tour: this was wonderful. I was part of a large van group leaving Auckland and then transferred to a larger official Hobbiton Tour bus when I arrived because that bus was going to Rotorua. Apparently, that afforded me more time during the tour. It wasn’t nearly as packed as I was fearing so I got a ton of great pictures without people blocking the facades. The Green Dragon Inn was easily the best part (great free beer!) and I picked up several souvenirs for friends at the gift shop. The day was also slightly overcast so it gave my pictures nice diffused lighting most of the time. The tour itself is really well done too, our guide was a college aged kid and he was clearly very knowledgeable. The bus driver too was fantastic. A great character! The whole thing is wonderfully well managed and put together. I wish I had more time to stay at the Green Dragon and the little outpost where all the buses stop, but this was still a great tour. Sudima Hotel: Good hotel, very helpful front desk staff. Fine room. I used the laundry services while I was there and that worked well. I didn’t take advantage of the available pool or hot tub because there were often families around. Town itself: I went to the Lakefront Market when I arrived (I think this was Sunday). Met several fascinating local craftspeople and bought more gifts for friends and family. Learned about Maori jewelry and wood bending. "Eat Streat" is a great selection of various restaurants that have something for everyone. I ate at Atticus Finch for late lunch/early dinner and Solace Cafe for breakfast/brunch, both were delicious. Walking through the downtown streets was even nice. Not as pretty as Queenstown or parts of Auckland, but still nice. You get used to the smell. Te Puia: I went here on Christmas Day. Tried to book a nearby zip-line canopy tour instead, but they weren’t responding to phone calls despite being open and I couldn’t book online for some reason. Oh well. Te Puia was a nice little experience. They have a Kiwi enclosure, but it’s almost completely dark to simulate nocturnal environment for the birds so I only saw one barely move in a small box via the video feed, but couldn’t see anything by just walking around the enclosure. The park itself is a nice walk. The geyser is very cool and I got some nice pictures of that, but the rest of the park seems to be suffering somewhat due to global warming and the other sulfur pools weren’t very impressive (some had dried up). The big mud pool was interesting though. I also saw the Maori Haka presentation and that was very cool. Totally didn’t feel weird performing the Haka on stage with everyone else (I totally did). Good gift shop. Waitomo Glowworm Caves: this was beautiful. The pictures you see online don’t really do the experience justice. It’s a very small period of looking at the glowworms while you’re silently traveling through the caves on a boat, but it’s very much worth it. It’s feel otherworldly. We had a really good tour guide too who sang a beautiful Maori song in the chapel portion of the caves. Another excellent gift shop and surprisingly decent food after the cave tour. The funniest thing to me is that because you can’t take pictures while you’re in there, they take two pictures of you outside before you get in. One picture of you looking at the camera and one looking in. Both in front of green screens. So at the end of the tour, they have photoshopped you “in” the caves, in front of pictures that they’ve already taken, as if you are looking up at the glowworms in those pictures. They look ridiculous. And of course, I bought them. Nadi/APTC: The guy that greeted me, I can’t remember his name, was very nice and helpful. Reminded me of my best friend in Portland, OR actually. I ate at Lulu Bar Restaurant and Cafe at the Denarau Marina, good sushi and I even liked the dalo slices — wish those were available on Mana. Mana Island Resort: this was a delightful place. Just the kind of relaxation I was looking for. Maybe a few more kids than I would’ve preferred, but the island was big enough that I could walk to a far end of the beach and read in quiet there. So beautiful. My room was gorgeous and THIS shower was actually the nicest shower I’ve been in simply because it was an outdoor semi-cylinder made of smoothed stones. Being able to look up at the sky and the palm trees and hear the birds and the wind while taking a hot shower was perfect. The overall staff was very lovely, but it was occasionally challenging when trying to get a very clear answer to a few questions. And some staff said different things when I asked the same question. They do a little speech when you arrive (accompanied by a lovely juice drink as a welcome), but they don’t go over all the info and even the information sheet they hand out as incorrect info on there. The “Fiji Time” approach was very easy to deal with, but the lack of clear and concise information at the start was a little frustrating. Food: They didn’t properly explain the differences in the food options at the restaurants/delis/buffets so you aren’t aware until you walk to all of them and specifically look at what is available. The food/drink options at the bistro and restaurants were great, but the buffet food was very hit or miss. For some reason, glasses for water were very hard to come by during buffet meals. And the meal options (from which you get to eat at the bistro, I believe) are only worth it if you need to eat a lot. Even the buffet is a little overpriced. But for some reason, dining at the nice restaurants was less expensive. Activities: I did a massage, which was amazing. Seriously amazing. I wish I could always smell that good. And I went scuba diving for the first time. I had gone “snuba” diving in Hawaii before (where you breathe like scuba diving, but your ‘tank’ is a raft that floats at the service above you so you’re tethered to that). Scuba diving was great. Instructor was very good. I had trouble with my respirator (it was much more difficult to breathe in than it should have been), but he switched me to the secondary respirator so everything was good. The coral around the island are not that spectacular, color-wise, but we saw 2 sting ray and loads of fish, including some of the brightest blue fish I’ve ever seen. Tried to book a sky dive but it was completely booked or they canceled on one of the days because it was too windy. Most of my time was just spent relaxing and reading. I went through two and a half books throughout the full trip! Oh, I also tried Kava. Best tasting muscle relaxer I’ve ever had. The kids didn’t didn’t appreciate the drink, but it’s a very interesting earthy beverage. I just had a wonderful time. I’m really glad the itinerary included a lot of these bigger things, but still allowed me time to explore and read. Had I gone with my original plan, with so many things to do in such a short time, I would have been exhausted instead of relaxed. I got to meet a bunch of really interesting people, most of whom were from other countries and in NZ on a work program for 6 months. 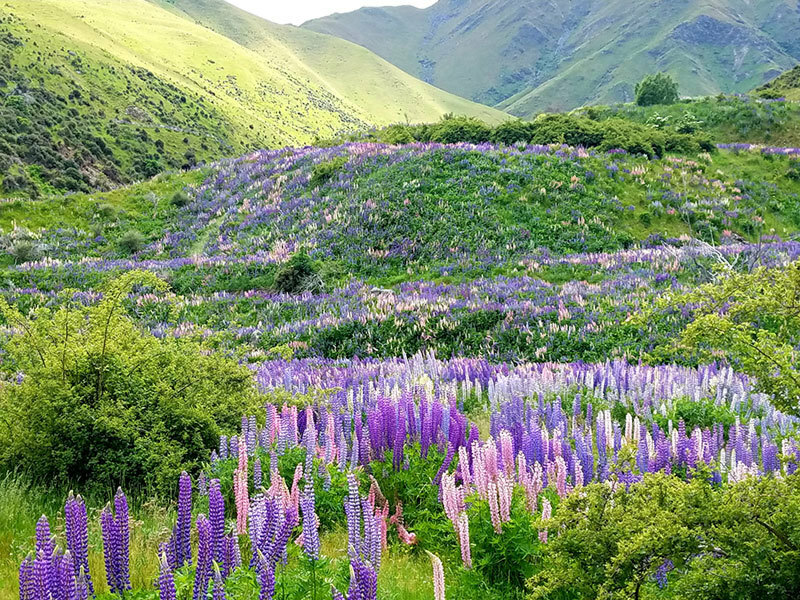 The fact that New Zealand alone experiences an influx of 75% of it’s population from tourism is astonishing… and yet, not that surprising given how wonderful the country is. Air New Zealand is my new favorite airline. Even economy feel like first class compared to flying domestically in the US. Traveling through customs was fine everywhere..
Again, I can’t thank you enough for such a wonderful trip. I hope I didn’t make your eyeballs bleed from this stupidly long email, but the details are all still so vivid that I want to relive them over and over. Hope you at least get a good laugh and eyeroll over my verbosity. Have a wonderful New Year and I will be sure to reach out when I want to return. but that isn't anything you could have done differently. The Christchurch Motel was our least favourite, but you did mention new ownership. We really enjoyed The Rocks Homestay - fresh breakfast in the morning was lovely. All the tours you arranged for us were fantastic and your recommendation to check out the sanctuary for kiwis was great, we saw 4 out of 5 kiwis in the exhibit. 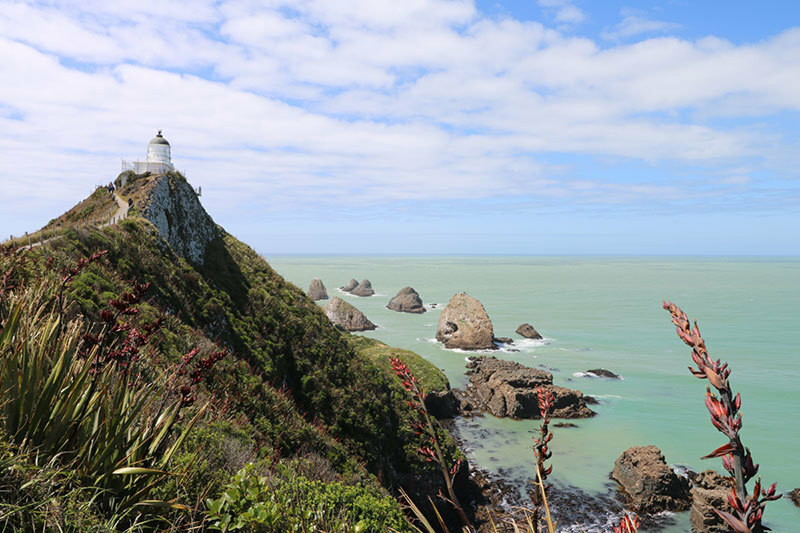 We would definitely recommend NZ Vacations to others and if we plan on coming back as well! We visited Milford Sound, and although it was raining and cloudy, we can still see the beauty behind it. Also, the drive there was stunning. We drove to Twizel. The drive was beautiful, but there was nothing at all to do in Twizel so we left within 24 hours and booked a night in Christchurch. We wish we stayed in Christchurch longer because we really liked it. Overall, it would have made more sense to skip Twizel entirely. I personally liked Auckland more than my wife and wish we had 1 more night there. I feel that area had a lot to offer. 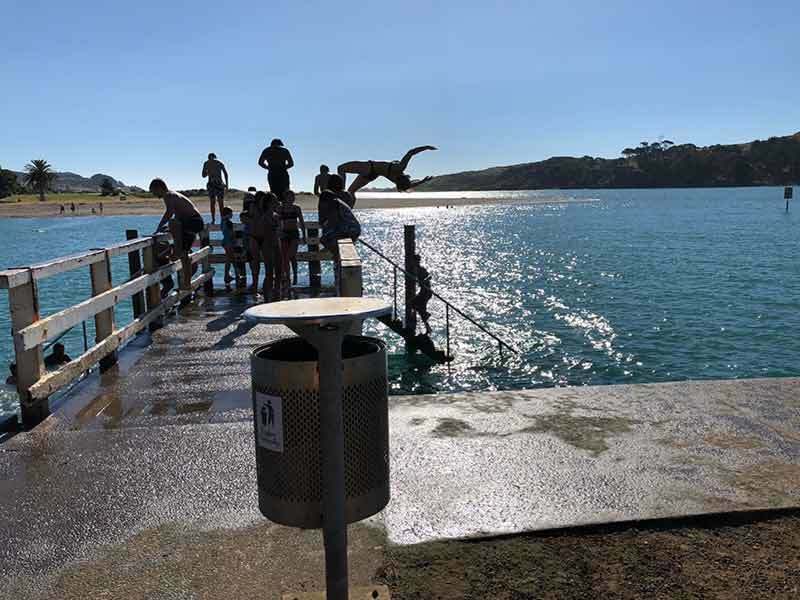 Tutukaka was okay...we didn't love it. We did a day trip called "The Perfect Day". It was nice, but the water was still very cold. Beautiful area though and pretty quiet. Hobbiton and Glowworm tours were really cool - both were highlights of our trip. Overall, we really loved the country and we hope to be back in the future. We will probably spend more time in Christchurch, Auckland and then maybe visit a couple of new cities as well. In any case, thank you for helping organize our honeymoon. Have a healthy & prosperous 2017!